For a play that has to have been largely conceived in 2009 (as it was a runner up in the Tron's Open.Stage playwriting competition), "Plume" remains remarkably topical. The events over Lockerbie on 21 December 1988 are burned into the memory of most Scots who were old enough at the time. I vividly remember the silence that fell over my group of high spirited school friends on hearing the news as we left a school disco. I can't even begin to imagine how it must feel for those who lost loved ones or were in Lockerbie that evening to have to live with the memories of that night. That's possibly why JC Marshall's play seems to have got in my head more than most. While the real world dramatis personae aren't named within the play, Marshall makes no attempt to distance it from the Lockerbie bombing and the subsequent release of Abdelbaset al-Megrahi on compassionate grounds. It's an approach that while adding to the weight of the work also seems to me to hamper it significantly as most of the audience will already have considered these exact circumstances and decided which side of the fence they stand on. Perhaps a fictionalised version would have left audiences more open to (re)considering their attitudes. Mr Peters (Sylvester McCoy), still grieving for the loss of his son William and infuriated by this latest act of (in)justice, and his former pupil Maller (Gemma McElhinney) each make their case for/against the bomber's release, but many aspects are dropped too quickly - particularly the suggestion that Scotland can make claim to being an inherently merciful and compassionate nation. A suggestion which doesn't exactly tally with the opinion polls of the nation at the time of Abdelbaset al-Megrahi's release. Marshall's choices for Finn Den Hertog's characters left me puzzled. Featuring William in flashbacks worked well but the use of his childhood imaginary friend, Alby, rather than just William's spirit/essence/ghost seems to add an unnecessary level of complexity. And the play's sustained 'bird' imagery didn't really work for me, feeling forced at times. Even with McCoy's compelling performance, his 'version' of what happened in the sky that night left me unmoved, although Waldorf was more convinced by it. 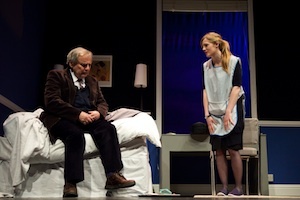 For me, the play's strength actually lies away from its 'issues' and in the relationship between Maller and Mr Peters. Here we have the demonstration of faith, hopes and disappointments that really got to me and that draws the elements of the play together. It doesn't matter whether either individually or collectively we can act compassionately - just aspiring to do so, or having others believe in us is sometimes enough. Despite its flaws, I found "Plume" to be a powerful and emotional piece of theatre, just not in the way I expected it to be. We received our tickets for the show through our membership of the Tron's Patrons scheme which we thoroughly recommend for anyone who is a regular attendee at the Tron. Plume runs at the Tron until 17th March. Image by John Johnston used with permission.